Bread baking books get me every time. I always want to jump in and bake everything. It was no different with Breaking Breads: A New World of Israeli Baking--Flatbreads, Stuffed Breads, Challahs, Cookies, and the Legendary Chocolate Babka by Uri Scheft, and I received a review copy. He brings an international perspective to his baking as an Israeli who has worked in Denmark, Italy, and France and has learned from Moroccan, Yemenite, and Turkish family and friends. He opened his own bakery, Lehamim Bakery which means “breads” bakery, in Tel Aviv in 2002, and expanded the business by opening Breads Bakery in New York City in 2013. His babka is famous, and the various recipes for that dough in the book all look delicious. There are careful instructions for filling, rolling, twisting, and shaping all the different flavors and types of loaves. And, the chapter for Challah shows some beautiful creativity. The dough is fashioned into braided, twisted, and stacked shapes, and there are even some loaves with cups baked into them for holding dipping sauces. The Black Tie Challah has a small braid covered in black sesame seeds along the length, on top of the larger braided loaf. Some of the flavors of challah include Chocolate and Orange Confit Challah, Marzipan Challah, and Sticky Pull-Apart Cinnamon Challah Braid. It’s inspiring to see a basic bread recipe taken in so many directions, and the reader is encouraged to experiment and try whatever shapes you fancy. Other breads include Brioche, Ciabatta, Pan de Mie, and an incredible Dill Bread that’s formed into a coil and snipped with scissors to make a flower shape before baking. There are cookies in the book too. I have the page marked for Chocolate-Dipped Vanilla Krembos which are made with a coconut macaroon base topped with a stable meringue that gets dipped into chocolate. I also marked the page for Parmesan Cookies that are a slice-and-bake savory snack with sesame seeds on the outside edge. 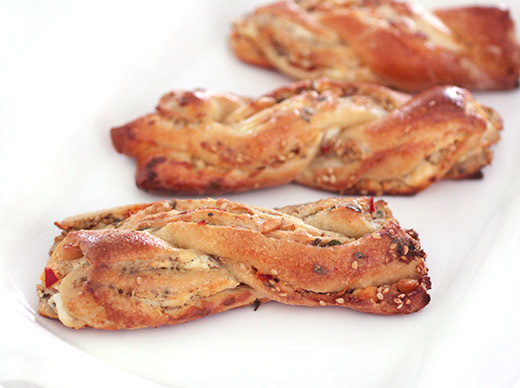 Before baking those cookies, I had to try the Za’atar Twists first. The twists are made with babka dough, and there is a Basic Babka Dough recipe and an Advanced Babka Dough recipe. Both start the same way with a rich dough made with eggs and butter. The advanced version becomes even richer with a process of layering in more butter in the way puff pastry is made. I opted for the leaner, basic option here. The dough was mixed and then left to chill in the refrigerator for at least an hour before proceeding with the rest of the recipe. 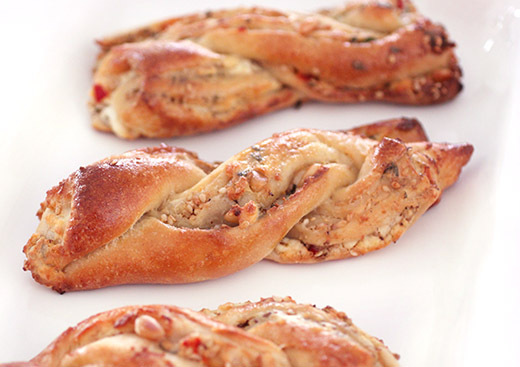 These savory twists are filled with a buffet of delicious things. And, now that I look more closely at a photo in the book, I realize that I probably left my filling a bit too chunky. In the photo, it appears that the feta was very finely crumbled to make a smoother, flatter layer. After the dough chilled, it was rolled out into a large rectangle. Labne was spread across the surface followed by finely chopped fresno chiles, a drizzle of olive oil, crumbled feta, toasted sesame seeds and pine nuts, chopped fresh oregano, and za’atar. I was delighted to find my oregano plants hadn’t been affected by our below freezing weather, and I was able to harvest plenty for the whole cup of leaves needed. The dough was then cut horizontally to make two long pieces. Each piece was rolled up as tightly as possible the same way cinnamon rolls are made. Then, each roll was pulled to tighten and lengthen. The rolls each ended up about 35 inches long. Those long rolls were then cut in half along the length and then cut crosswise to make seven pieces from each of the four long strips. Those cut strips were then joined in pairs and twisted. The twists were left to proof for a few hours before being brushed with egg wash and baked. My twists are a bit less tidy than the ones pictured in the book since my filling wasn’t quite as smooth. But, as the author points out, no matter how your results look, they will taste great—and they did. These are kind of a meal unto themselves due to all the flavor from the feta, oregano, and za’atar and the added texture from the nuts and seeds. And, the dough was a lot of fun to work with and form into twists. As always with bread books, I’m going to be baking more things from this. Excerpted with publisher's permission from Breaking Breads by Uri Scheft (Artisan Books). Copyright 2016. 1. Toast the sesame seeds: Place the sesame seeds in a small skillet over medium-high heat and toast them, shaking the pan often, until they are golden brown, 2 to 3 minutes. Transfer the seeds to a small plate and set aside. 2. Roll the cold babka dough: Unwrap the cold babka dough and set it on a lightly floured work surface. Roll the dough into a 12-by-28-inch rectangle (it should be just a little shy of ¼ inch thick) with a long side facing you. Pull and shape the corners into a rectangle. 3. Fill and roll the dough: Spread the labne over the dough in a thin, even layer. 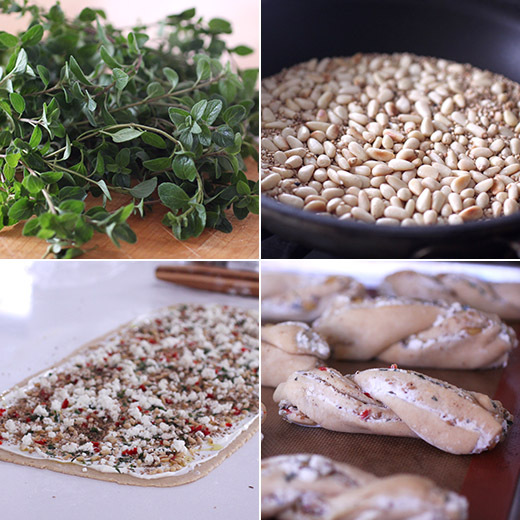 Sprinkle it with the jalapeño, olive oil, feta, toasted sesame seeds, pine nuts, oregano, and za’atar. Divide the dough in half horizontally so you now have two 6-by-28-inch pieces. Working from the long bottom edge of one of the pieces, roll the dough up into a tight cylinder, pushing back on the cylinder with each roll to make it even tighter. Lift the cylinder, holding one end in each hand, and gently stretch and pull to tighten it even more (it will stretch to about 35 inches long). Repeat with the second piece of dough. 4. Divide the dough into strips and make the twists: Use a bread knife to slice each cylinder in half lengthwise so you have 4 long pieces, and then slice those pieces crosswise into 7 equal sections (about 5 inches each) to make a total of 28 strips. Cross 2 equal-size pieces to create an X, keeping the exposed filling facing up. Twist the ends together like the threads on a screw so you have at least 1 twist on each side of the X (3 twists total). Repeat with the remaining pieces. Set 7 twists on one parchment paper–lined rimmed sheet pan and 7 twists on a second parchment paper–lined sheet pan. 5. Let the twists proof: Cover the sheet pans with plastic wrap and set aside in a warm, draft-free spot until the twists have doubled in volume and are very soft and jiggly to the touch, 2 to 3 hours, depending on how warm your room is. 7. Bake the twists: Make the egg wash by whisking the egg, water, and salt together in a small bowl. Brush egg wash over each twist, and bake until they are dark brown and baked through, about 20 minutes; check the twists after 15 minutes, and if they are getting too dark, tent them loosely with a piece of parchment paper. Remove the twists from the oven and, while they are still warm, brush with more olive oil and sprinkle with a little za’atar. Serve warm or at room temperature. 1. Make the dough: Whisk the vanilla into the milk in the bowl of a stand mixer fitted with the dough hook. Use a fork or your fingers to lightly mix the yeast into the milk. Then, in this order, add the flours, eggs, sugar, salt, and finally the butter in small pinches. 2. Mix on the lowest speed, stopping the mixer to scrape down the sides and bottom of the bowl as needed, and to pull the dough off the hook as it accumulates there and break it apart so it mixes evenly, until the dough is well combined, about 2 minutes. If the dough is very dry, add more milk, 1 tablespoon at a time; if the dough looks wet, add more all-purpose flour, 1 table-spoon at a time, until the dough comes together. Increase the mixer speed to medium, and mix until the dough is smooth and has good elasticity, 4 minutes. 3. Stretch and fold the dough: Lightly dust your work surface with flour and turn the dough out on top; lightly dust the top of the dough and the interior of a large bowl with flour. Grab the top portion of the dough and stretch it away from you, tearing the dough. Then fold it on top of the middle of the dough. Give the dough a quarter turn and repeat the stretch, tear, and fold. Continue to do this until you can stretch a small piece of dough very thin without it tearing, about 5 minutes. Then use your hands to push and pull the dough against the work surface and in a circular motion to create a nice round of dough. Set the ball in the floured bowl, cover the bowl with plastic wrap, and set it aside at room temperature for 30 minutes. 4. Chill the dough: Set the dough on a piece of plastic wrap and press it into a 1-inch-thick rectangle. Wrap the dough in plastic wrap and refrigerate it for at least 1 hour or up to 24 hours. So delicious! I love these twists with that sensational filling. They must taste mighty good! A great combination of flavours. i don't think i've tasted za'atar nearly enough in my lifetime. what great flavors and textures to enhance a very attractively shaped bread! i'd be very interested in this cookbook! I have never had za'atar...and I am already loving it...it sure looks so flavorful and nice twists...picture perfect Lisa.